This workbook is specifically constructed for students studying Latin. Veteran teacher Elizabeth Heimbach organizes English derivatives by topic—two chapters devoted to affixes, twelve chapters presenting special topics like mythology, and eleven chapters featuring grammar-related derivatives like prepositions and deponent verb derivatives. A student-friendly and engaging narrative presents derivatives and demonstrates the symbiotic relationship between Latin and English. The text provides students the skills and practice to apply word-building analysis to their study of both Latin vocabulary and English derivatives. 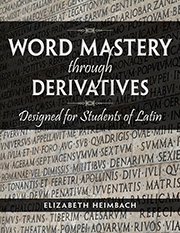 Word Mastery through Derivatives Designed for Students of Latin by veteran teacher Elizabeth Heimbach is workbook is specifically constructed for students studying Latin. Heimbach organizes English derivatives by topic. Two chapters are devoted to affixes, twelve chapters present special topics like mythology, and eleven chapters featuring grammar-related derivatives like prepositions and deponent verb derivatives. A student-friendly and engaging narrative presents derivatives and demonstrates the symbiotic relationship between Latin and English. The text provides students the skills and practice to apply word-building analysis to their study of both Latin vocabulary and English derivatives. Of special note are the "just for fun" activities for each special topic chapter. Enhanced with appendices that list of derivatives broken out by chapter, as well as a list of phrases used in English, Word Mastery through Derivatives Designed for Students of Latin is an ideal and unreservedly recommended addition to academic library Latin Studies instructional reference collections in general, and as a Latin Studies curriculum supplemental studies reading lists in particular.